When you buy packaged food at the grocery store, you can check the nutrition label to see what’s inside. Similarly, Hennebery Eddy design staff research Environmental and Health Product Declaration (EPD and HPD) labels to evaluate the life-cycle environmental impacts of the building materials and finishes we specify on our projects. And now, anyone can see “what’s inside” the business of Hennebery Eddy through our JUST label. We submitted of a range of metrics in six categories and were recognized through a 1-, 2-, and 3-point rating. Hennebery Eddy’s JUST label is reflective of the firm’s long-standing commitment to a net-positive design philosophy, social responsibility, and workplace equity. We rated well in diversity and investment metrics but also found areas to improve regarding worker benefits. As a public pledge to evaluate these areas for continual improvement, all JUST labels are available to review online and must be renewed every two years. 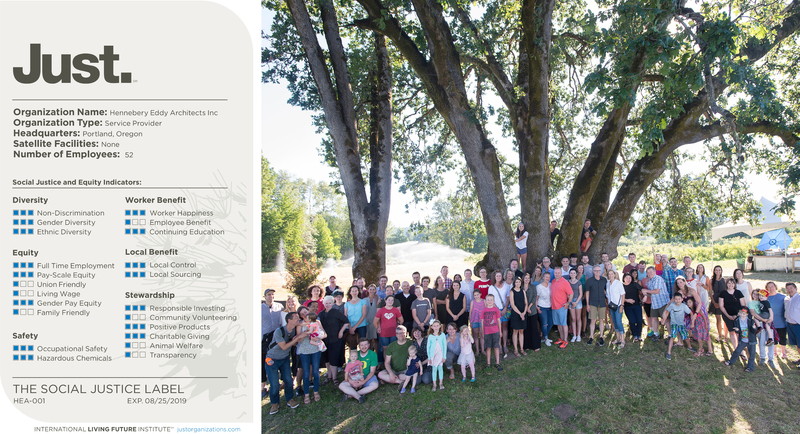 As noted in a recent article (subscription required) from DJC Oregon, “The label serves as a tangible reminder for companies to make sure that policies discussed in boardrooms are put into action.” The JUST program provides a framework to help guide Hennebery Eddy’s growth, in line with our Core Firm Values. It’s also a way for prospective staff and clients to evaluate our firm as an employer and partner — one that is proud to participate in building a more socially responsible community.